Cardboard is versatile and long-lasting. With a little creativity you can decorate any room and make it look warmer and more stylish with cardboard. Using easy-to-find items you can turn a simple piece of cardboard into wood-like paneling or even beams for the ceiling or walls. Your imagination is the key to what you can create from cardboard. You can make cardboard imitate aged wood to give your rooms a rustic and homey look, or use bright colors to spice up a modern décor. Spread a plastic drop cloth over the area you are working in. Make sure to cover furniture and other items you want to protect from paint drips. Stand the cardboard up so it faces you like an easel. Use a cardboard box to prop the piece you will paint up into an inclined position. Apply a thin layer of the black spray paint over the front of the cardboard. The paint should be inconsistent with narrow streaks of the cardboard color showing through. Dip the wide paintbrush into the white paint and rub off the excess paint on a piece of scrap paper. You should keep only a small amount of paint on the bristles to avoid heavy streaks. Paint long stripes of white on top of the black background with all of the white stripes running in the same direction. The distance apart you space the stripes will be the amount of space that appears between the painted planks. Emphasize the spaces between stripes to create more depth in the painting. Use the thin brush with black paint to deepen the black space between each pair of stripes. Define the edges of the white stripes with the thin brush and white paint. Apply the paint following the lines of the stripes to make each stripe look like an individual piece of wood. 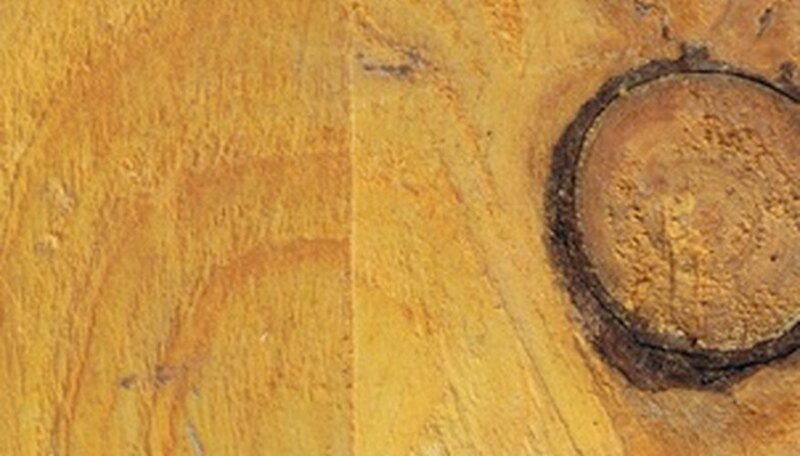 Add small spots of black outlined in white to create the effect of knots and holes in the wood. Use this effect sparingly to keep the "wood" looking realistic. You can cut thin, narrow strips of cardboard and attach them on top of a larger piece to create a three-dimensional feel for your faux wood. Do not use cardboard in place of wood to build anything because cardboard is not strong enough to substitute for real wood in construction.